Many students now expect that courses will be supplemented by web sites and multimedia presentations in the classroom. At the same time faculty are discovering that multimedia present new opportunities and challenges for teaching. The purpose of this presentation and document is to provide the background necessary to move forward into the digital age of course materials with foresight and finesse, choosing the right solutions for the right problems. The presentation is broken down by types of information that can be easily converted into electronic form, followed by a discussion of options for each media along with current and promising tools. Each section concludes with references and pointers to appropriate web sites. Our focus will be how to distribute multimedia via the web, for that is the best and easiest way to share your work with a large audience. We have developed a set of integrated web based tools called the Faculty Toy Box to make developing web based multimedia easy. All the technologies discussed here can be found inside or used within the Faculty Toy Box, which is discussed in more detail below. Other workshops we provide focus on classroom presentations. Just about every faculty member of the School of Medicine teaches with slide presentations, either via PowerPoint or other presentation program. Students normally get to see slides only a few seconds during a lecture, yet in many cases slides deliver the most important content of your educational presentation. One can argue that providing access to slides outside of the lecture hall can have more effect than practically any other multimedia approach. Students are frequently interested in having a printout of a slide presentation. In that case, the best option is to create an Acrobat PDF file from the “print handouts” option within your presentation package. We have found that generally four slides per page works best, and these can be printed, zoomed and viewed in color. Typically the PDF file is 10-30% of the size of the original, which makes viewing and download the file much more feasible for students. The process of converting PowerPoint files to PDF files and uploading them to a web site has been automated in our course content management system within the Faculty Toy Box. You simply upload the file using your web browser and the server converts your PowerPoint to a PDF and links it to your course web site. PDF files are discussed further below. Animations in PowerPoint presentations present some great opportunities for explaining difficult to understand processes, but there are some challenges in distributing those files. If you convert a PowerPoint presentation to a PDF, as described above, the PDF file will display a static image of the last stage of the animation. This can be inappropriate if you show and hide several graphics in the same location, but conflicts can be avoided if you design your presentation with the limitations of the PDF format in mind. Alternately, you can distribute the original PowerPoint file as well as a PDF version via a web site. However, this assumes the student has either the full version of PowerPoint, or the PowerPoint viewer is installed. And if your presentation has a lot of graphics, the PowerPoint file can be quite large, causing very slow downloads. There are several tools that allow you to convert highly animated and narrated PowerPoint presentations to Flash. We use Camtasia Studio, Adobe Captivate, PowerConverter from Presentation Pros and Apreso for PowerPoint, depending on the needs of a given project. All dramatically reduce the size of a PowerPoint presentation, yet retain transitions and animations. The gotcha is that you have to run it through a converter and then manually link the resulting files into a web page. There are other distribution options for on-screen slide presentations via the Web. PowerPoint, Harvard Graphics, and other presentation packages and have the option to export presentation outlines and slides directly to HTML (hypertext Markup Language) the native language of the Web. Images of the slides are saved as GIF or JPEG files which are automatically inserted into HTML documents. This is an easy solution for users, for no plug-ins or helper applications are required, and this approach requires relatively little work. But when exporting to the web from PowerPoint be sure to check the option to make the presentation compatible with Firefox, Netscape and Internet Explorer (if given that option), or you will lock out many learners. The default settings will only work for Internet Explorer users. The disadvantage of this approach is that there is no way for the learner to easily print out the presentation, which is frequently desirable. Also, the “export to the web” feature in PowerPoint has grown successively more buggy with each release of Office, the most common problem being that graphics like arrows and labels don’t line up properly with pictures. If you have a large archive of 35mm slides that you need to convert to digital format, we can facilitate the scanning and import the resulting files into our Multimedia database. The database allows you to write descriptions of each image and enter keywords, so that you may easily search your collection. In general, if a faculty member already uses presentation software to produce slides, producing a web version is an easy addition. This also allows presentations to be changed right up to the time of lecture. One can argue web delivered presentations provide greater value than the other multimedia options discussed here, for they many times include information otherwise unavailable to students. There are five major digital movie formats, QuickTime, Windows Media/AVI, Flash, RealVideo and MPEG, but our group supports primarily the use of QuickTime and Windows Media. QuickTime offers cross-platform support, multiple audio tracks, video/audio streaming, Virtual Reality technology, SMIL, MPEG-1,2, and 4, JPEG 2000 support, and an plug-in architecture that supports third-party add-ons. Windows Media is the successor of AVI and less versatile than QuickTime, MPEG-2 is primarily used for CD and DVD distribution, and MPEG-4 is rapidly becoming the basis for networked video from cell phones to high definition DVDs. RealVideo is a streaming technology and is best suited for long video or audio files, though image quality can be vary, depending on network transfer speeds. Flash video is becoming very popular for the Flash plugin is the most common plugin on computers today, so nearly everybody can play it. Windows Media is the best format for inserting movies in PowerPoint. High quality digital video files have been most commonly distributed via CD-ROM or DVD because of their large size, but are increasingly distributed via the Internet as network speeds have increased. Streaming video systems like Flash, RealVideo, QuickTime, MPEG-4 and Windows Media download part of the file into a buffer on your local hard drive, then begin to play back the file as they continue to download in the background. They also delete the buffered file as it continues to play. The the UVA School of Medicine maintains a Quicktime/MPEG-4 streaming server. ITC currently maintains Real, QuickTime, and Windows Media streaming video servers. QuickTime has the advantage that it can also be played back from a standard web server, with some feature tradeoffs. Quicktime/MPEG-4 is also the format used for video Podcasts. If you want to shoot and edit your own movies there are three facilities than can be of help. Academic Computing Health Sciences (ACHS) has two machines set up to edit either miniDV or VHS tapes and the Health Sciences Library has a similar facility. In central grounds, the Robertson Media Center in Clemons Library offers similar facilities. The Health Sciences Library will also check out digital camcorders for use by faculty. These facilities usually encourage and support the use of iMovie for quick and easy editing of digital videos. To embed movies into a PowerPoint file the movie must be in the Windows Media or AVI formats. Although QuickTime files were usable in previous version of Office, Microsoft intentionally removed the feature in later versions. QuickTime Pro, which costs $29.95, can export any QuickTime movie to AVI. PowerPoint on the Mac fully supports QuickTime, and can even export an entire presentation as a QuickTime file. Copyright law restricts the duplication of commercially produced videos that are commonly used in the lecture hall. Legally you can only digitize video that you have produced, or have written permission to reproduce and distribute. Many people are interested in using videos published on YouTube. It is possible to insert YouTube videos into a PowerPoint presentation, but it is a multi-step process of downloading the video, converting the video to a format PowerPoint can display, and then inserting the video into PowerPoint. A link below steps you through the process. Alternately you can just display the videos from YouTube in your web browser and toggle back and forth between PowerPoint and your browser. Currently the two best approaches to using digital video are 1) adding a short high quality video clip or animation to illuminate a difficult to understand process or procedure, 2) using streaming video (or audio with slides) to illustrate long topics or 3) using progressively downloaded video for high quality playback. Some of the most popular programs we have produced are short videos that demonstrate procedures such as performing a neurological exam, or performing a venipuncture. The Office of Medical Education will work with faculty and departments to produce educational videos and publish them on the web at no cost. Podcasting is a way to record presentations, either audio, video, or screencast, and make them available over the web. As the name implies, these recordings may also be played back with an iPod, though other media players can also play these presentations if a compatible file format is used. Currently most basic science courses in the School of Medicine are recorded as MP3 audio files and posted to course web sites along with the PowerPoint presentations. Students may view the PowerPoint file and listen to the recordings at any pace they choose. Professional grade MP3 recorders are installed in the podiums in Jordan 1-4 and 1-14 that are connected to the sound system. Student employees retrieve the MP3 files each afternoon and post the files. Faculty may opt out of the recordings for any reason. About 50% of the students in these courses report that they use the MP3 recordings as a study aid. Some departments make MP3 recordings of chalk talks using small portable recorders, and then post them to their educational web sites. This is a simple and easy approach for subject matter that is well suited to audio only recordings. It is possible to “screencast” presentations as well using Camtasia. A screencast is a recording of all the visuals presented on the presenter’s computer synced with the voice of the presenter. Camtasia Studio saves the presentation, and supports export in several formats. Camtasia produces a very high quality recording, but it takes hours to export an hour long lecture. Adobe Captivate will also record screencasts, plus it lets you add in branching interactions when editing the presentation. So this is more powerful, but has a little longer learning curve. Jing is a very easy to use free screencast tool. It can be learned in just a few minutes and produces high quality screencasts, but can only make short recordings. Jing also provides free web space to upload and distribute your screencasts. Small, simple and to the point is Jing’s approach, and it works well. Videos may be podcast as well, and our faculty have developed a number of podcast videos of physical exams and clinical skills. These can be useful for “just in time” training. A student can make a quick review of a skill video on an iPod or PDA just before they perform the technique. Podcasts do not have to be reviewed on a portable device. In fact most podcast recordings are reviewed on laptop or desktop computers. Many schools that produce a lot of podcasts provide recordings in multiple formats so they are optimized for both desktop and iPod delivery. The School of Medicine is developing more automated methods for producing podcasts on a larger scale and will pilot the solution in the spring of 2009, with plans for a production deployment in fall 2009. This system will automatically make screencast recordings of lectures in Jordan 1-5 and 1-14 and automatically link those recordings into the appropriate course web sites. Virtual microscopy is a technology that allows learners to pan, adjust magnification, and even focus digital microscopy slides. The School of Medicine recently purchased a digital microscopy scanning system from Aperio and we have modified our imaging applications within the Faculty Toy Box so that virtual microscope slides may be used within any of our applications including image tutorials, quizzes, tests, and case presentations. Virtual microscopy will probably revolutionize pathology that way that PACS has revolutionized radiology. Once Aperio has their system fully certified as a medical instrument by the FDA, a technician will be able to collect and scan any tissue and upload it to a server, where it can be analyzed over the Internet by a pathologist. This will allow community hospitals and clinics to have access to pools of highly specialized pathologists anywhere in the world. The advantages for learners are clear as well. Many medical students never fully master the use of an optical microscope, and spend a lot of time and energy struggling with the instrument, rather than focusing on the imaging content. This system frees the student from the microscope, and from the lab, and it gives all students access to the same set of tissues. Microscope slides can be scanned now in the Biomolecular Analysis Facility. Images within the UVA SOM are displayed using a customized Aurora mScope server system integrated with the UVA Multimedia Database. If you are interested in converting large quantities of documents into electronic format Adobe’s Acrobat PDF technology has a lot of advantages. It remains the easiest and fastest way to convert word processed and graphic files into a cross-platform, network deliverable format. Acrobat’s PDF format and Acrobat Reader technology are easy to distribute on CD-ROM or via the Web, and the PDF format retains a remarkable fidelity to the original document, including imported figures, scanned images, Greek characters, and formulas. The creation of PDF files requires the purchase of Adobe’s Acrobat or the use of our Faculty Toy Box, our Course Content Management System that will automatically convert uploaded files to PDF. Acrobat gives several options for creating PDF files for multiple users on both PC’s and Mac’s, but creating a PDF files can be as simple as printing a document. Mac OS X has the ability to create PDF files built into the operating system. We have automated the process of converting Word handouts to PDF handouts within the Faculty Toy Box. You simply upload the file using your web browser and the server converts your Word file to a PDF and links it to your course web site. UVA has a volume licensing agreement with Adobe, which gives UVA faculty Acrobat Professional for about $50 per copy. Acrobat also allows you to add hyperlinks within and between documents, embed audio or video files, and build truly interactive documents. The text within PDF files is not readily editable however, so updating hyperlinked PDF files can be laborious. There are several other PDF viewer packages besides Acrobat, and you should be aware that they usually do not support all the same features as Acrobat, but they may have their own unique advantages. For example, Preview by Apple has search capabilities that are dramatically faster than Acrobat’s. HTML is the native language, or method of creating documents, for the World Wide Web. It can handle formatted text, bitmap images, and can call upon helper applications and plug-ins to extend its capabilities to animation and digital video. Of all the options discussed here, HTML produces the smallest file sizes which is optimal for fast network transmission. But HTML many times cannot reproduce the formatting of print documents exactly and currently does not support formulas, making the conversion of many medical and scientific documents problematic. HTML is the dominant format for Web distribution, but requires a fair bit of technical expertise, software, and time to produce in large quantities. The latest generation of HTML tools are much better though, with Dreamweaver being the most popular (and supported) WYSIWYG HTML editor . The big advantage of HTML is that any web browser can then view your files without additional software. And even in you choose to use Acrobat or animation plug-ins, some HTML will be required to point to these types of files for Web distribution. So some familiarity with HTML is helpful, at least for somebody on staff, for it is the glue that holds everything else together on the Web. And if your documents are not highly formatted and do not include formulas and lots of Greek they may be pretty easy to convert. But be aware that large scale conversions to HTML can be quite labor intensive. Most medical students quiz themselves in preparation for an exam. On-line practice questions are highly valued by our students, with many of the basic science courses making them available, and questions can include videos, figures, photographs, virtual microscopy, or animations. Practice questions may also be embedded within a tutorial or case presentation, or point to tutorials for further explanation. We have developed several question presentation formats and even have a format that emulates the computerized board exams. So, while preparing for course exams, the students will also be overcoming computer test phobia for the boards. Practice questions can have photographs, diagrams, movies or sound files integrated into their display. Practice questions can also be integrated into tutorials, making the learning process more like carrying on a conversation with a faculty mentor. This approach is used in several Pathology tutorials. Most of our practice questions are now stored in a database within the Faculty Toy Box and faculty can edit questions through an easy to use web interface, with the changes taking effect immediately. The same question database can also be used to produce on-line graded exams. Many courses use these on-line tests as weekly quizzes to encourage students to study well before the next big exam. The on-line testing system also generates grade reports and test item analyses. 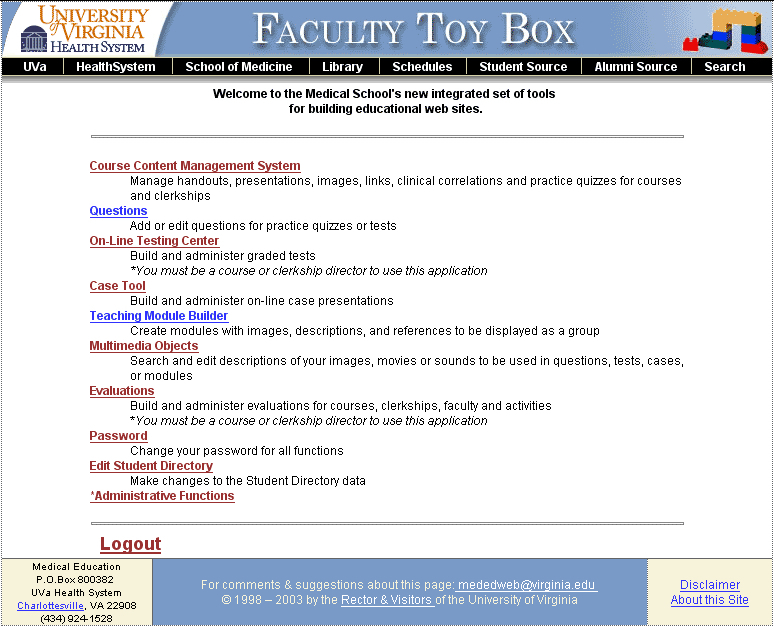 The question database and on-line testing system are components within the Faculty Toy Box, which is available for use by any UVA School of Medicine faculty member. Plug-ins are ways to extend the capability of web browsers so that they can view a wider variety of file types. The capability of a plug-in and a helper application may be the same, but a plug-in will display a non-HTML document within the main window of the web browser. With the proper plug-ins, a web browser can directly display QuickTime or RealPlayer movies, PDF documents, animations, 3D molecules, and even interactive Java applications or games. Plug-ins are usually distributed for free by the software developers. The plug-ins for RealPlayer, PowerPoint, QuickTime, and Acrobat have already been discussed in some detail. Although there are hundreds of plug-ins available today, the ones that stir up the most excitement from educators are the Flash and Shockwave plug-ins from Adobe. Adobe is the developer of some of the most commonly used multimedia development tools, including Flash, and Director. While Shockwave is a derivative of CD-ROM oriented technology, Flash was designed specifically for animation and interactivity on the web. Flash is easier to use and results in smaller files that Shockwave, and the latest version is very versatile. Flash is frequently installed with the newer versions of the browsers, with Adobe claiming that the Flash Player is installed over over 98% of all computers. As a result, you can assume with some confidence that practically anybody can view a Flash file. Recently Flash has become a very popular format for distributing compressed web video. We have been working with Dr. John Voss to produce a health economics simulator in Flash for a couple of years. Another exciting plug-in that you will be seeing frequently is QuickTime Virtual Reality (QTVR), which delivers 3D imaging through web browsers. QTVR is an extension of QuickTime technology that allows an author to “stitch together” a series of still images to form a panorama or a rotatable 3D object. A white glove over a QTVR movie allows you to pan or tilt your perspective, or to spin around an object. This technology is particularly exciting to anatomists and surgeons. QTVR supports clickable hotspots, which let you use 3D objects and panoramas as navigational structures. The Health Sciences Library is photographing many of it’s objects in the historical collection and making them available at QTVR movies. RealPlayer has become a very commonly used plug-in to play back large, streamed audio and video files. QuickTime, Windows Media and Flash are also another attractive streamed audio solutions. All four allow listeners to begin listening to audio as large files are being downloaded. Clinical case problems can be presented several ways. Typically in a classroom or small group session cases are presented in a fairly linear fashion with pauses for discussion. This presentation format can easily be converted to a digital format using any of the methods discussed above. Case simulations are more complex and more challenging to the learner. They involve creating a realistic patient encounter in which the learner makes decisions about management of a case, and the learns the result of that treatment plan as the simulation unfolds. Case presentations can be delivered on the web, and even though they may not give a realistic experience of patient management, they can provide a learning experience that involves the learner much more than a paper based case. Dr. Larry Gimple in cardiology has developed many teaching cases and integrated them into his CME web site, Cardiovillage. Dr. Steve Borowitz has created web versions of some of his case presentations for use by medical students and residents. Dr. Stephen Huff has developed several case simulations in neurological emergencies suitable for resident training or CME. Both of these authors manually built these cases, which offers a lot of flexibility, but requires a lot of time. As a result we have developed CaseTool, a component of the Faculty Toy Box, which automates the case development process. CaseTool allows authors to create interactive case presentations by simply filling in fields in a web form and choosing what labs and procedures to offer with some check boxes. We offer a workshop each year on how to use CaseTool, but can also offer individual instruction. Faculty generally find that they can have their first case roughed out and up on the web within a couple of hours. UVa faculty have developed more than 200 online case presentations for both training and evaluation. The Office of Medical Education has also developed new tools for the development of more complex case presentations. These allow case authors to work with a familiar tool, PowerPoint, to create complex branching case logic to display cases in a variety of specialties. After authoring the case in PowerPoint, we run the case through a Flash converter which maintains all the hyperlink logic, but compresses the file, making it suitable for web distribution. Case simulations are a great way to make sure that your students are trained in core diseases and conditions that they may not observe during a short rotation. During the summer you could train on flu management and during the winter on ragweed allergies. Case simulations can provide either an educational experience, or act as an evaluation, as all student responses are recorded and multiple choice questions are graded automatically. Case simulations offer a new way to improve the consistency of our teaching and learning experiences. Blogs and Wikis do not necessarily contain multimedia, but they may, and they are increasingly popular for medical educators. Blogs and Wikis share a lot in common, mainly that they make it easy for educators or learners to write web pages simply using a web browser. Communities of learners can also collaborate to produce consensus documents, or build large webs of documents around a common theme. Both can be excellent tools to encourage reflective writing that is shared within a group. The School of Medicine has developed a Wiki tool that has a great deal of control of who can read, write and comment upon pages. All of our Wiki sites are password protected. The examples below are of publicly available Wikis and Blogs on the Internet. Web Conferencing is a way to share your live or recorded presentation with other people viewing the presentation over the web. The way it works is that the presenter installs software on the computer being used for the presentation, and establishes an account with a web conferencing service. The presenter sends a URL and login information (provided by the web conferencing service) to the people viewing the presentation. The presenter and participants all log in to the web conferencing service, and the desktop of the presenter is displayed via a web browser on all the participants’ computers. Usually the audio part of the conference is handled via telephone audio conferencing, though some services support the use of Skype or other VOIP (voice over IP) methods. Some systems allow the presentation to be recorded and posted to a web site, protected by a login. Several also support online whiteboards, text chat, and web cams to show the face of the presenter. Many of the services are free if you need to connect with only a few people, but charge a monthly fee if you need to connect to more people simultaneously. Some services require the installation of plugins, which can be problematic. Others rely upon the commonly installed Flash plugin, or Java. This is a very rapidly evolving field, with new vendors coming into the market constantly, and pricing plans getting less expensive. WebEx is probably the largest vendor in the market, but Adobe’s ConnectNow also has a large presence. Yugma is unique in that you can connect up to 20 people for free. Each service has its own advantages and disadvantages.There are discussings now at the University level to site license one or more of these tools. This database includes over 10,000 images, sounds, animations and movies, all produced internally, that may be used by UVa faculty or residents in any presentation. This NIH and NSF supported project is a clearing house of educational multimedia for medical educators. You may also submit your materials to HEAL for peer review and publication. The AAMC has established a project similar to HEAL, but it is focused on primarily teaching cases and educational modules. You may also submit your materials to the portal for peer review and publication. Our health sciences library licenses several databases of images which may be used for presentation. The licenses that determine how you can use these images will vary. Java is a programming language developed by Sun that is similar in some ways to C++ in syntax. Sun’s goal for Java is to make applications that can run inside a “Java aware” web browser across all platforms. Java applications do not require that the user download any plug-in or helper application, but can greatly extend the capabilities of a Web browser. Java is interpreted by the web browser so, even though it is similar in syntax to C++, it runs considerably slower, more like applications written in Visual Basic. Java is expanding what is possible to do over the web, but most of what Java has promised is still over the horizon, and if Microsoft has its way, will remain that way. Most Java applications currently in use are server side applets, meaning that they execute entirely on the web server and output HTML as their result. That avoids compatibility problems found with client-side applets, and improves performance over other competing technologies in many situations. Using Java on the server can be called Java Server Pages,or JSP. Today Java is mostly a tool for professional programmers requiring special training and a high investment of time. To make life easier for faculty developing educational web sites, Medical Education has created an integrated set of tools called the Faculty Toy Box. Within the Toy Box you can: write questions that can be used in practice quizzes or on-line tests, create on-line case simulations, write descriptions for multimedia files (movies, sounds or pictures) that you have submitted, build course modules that display pictures and text, and create course and faculty evaluations. Accounts are required to use the Faculty Toy Box and an account request form is available from the login page. For training on how to use the system contact John Jackson at jjackson@virginia.edu. In some situations faculty may find two other content management systems to be useful. If you are developing training materials for residents or fellows, the NetLearning system offers the advantage of tracking all learning activities and offering complete activity reports. Some clerkships have found the content management system offered by the Web Development Center to be the best fit for sites that don’t constantly change or have complex training applications. In any case, we’ll work with you to fit your project to the best available tools. The first question to ask when considering multimedia is, “What capabilities will the multimedia format add that we currently do not have?” Providing access to teaching slides can be a unique and valuable resource not easily duplicated in other ways. Case simulations can be a great small group teaching tool, or good independent learning exercise. Practice quizzes are good ways for students to check their knowledge. On-line graded quizzes offer automated scoring and reports. The multimedia database offers thousands of images, movies and sounds that can be used on your web site, or within your PowerPoint presentations. It is up to you to determine what would most benefit your situation. The Office of Medical Education will support faculty efforts to produce educational multimedia for any UME training program or course. This includes designing an effective educational product that meets your needs, building animations, digitizing and editing video and putting the whole package together. The ACHS facility and the Health Sciences library also offer all the equipment needed for digitizing radiographs, slides, microscope slides and video. We offer a workshop in the spring on authoring cases, but we also work with faculty one-on-one on projects at any time.